The Best of the Best...Waterfront encompasses secluded Chalet built with exceptional care. 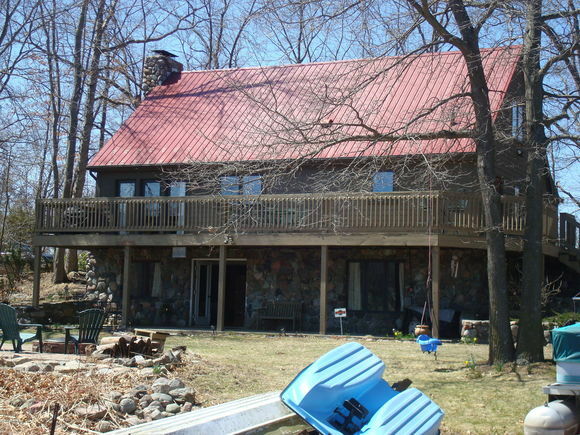 Home nestled in the trees with cleared areas for Patios & Dock. Interior features a 3 season room, an open floor plan plus bedroom loft with built in chest & large closet. Main floor Living room has a Massive wood burning Stone Fireplace that reaches the top of Cathedral ceiling. Every stone was hand selected by sellers. Kitchen has a center island/snack bar with storage. Dining area has view of the lake & exit to upper deck. Main Laundry/Mud room are by the kitchen for convenience with closets, shelving, cabinets & sink. Lower recreational area has French Door to the cement patio, Lake Views & Stone Fireplace containing a pellet stove insert. Lower 3rd BR just needs a wall installed. Long Lake Rd. Turn West on Ridge Drive. Follow to the T which is Lucille Lane. Make a right. Follow to end. Hello, I’m interested in 5656 Lucille Lane and would like to take a look around. The details on 5656 Lucille Lane: This house located in MI 49274 is currently for sale for $259,900. 5656 Lucille Lane is a 2,190 square foot house with 2 beds and 2 baths that has been on Estately for 5 days. This house is in the attendance area of Reading Junior Senior High School and Reynolds Elementary School.